I remember sitting in my school’s computer lab, trying to covertly finish last night’s Spanish homework (el naturalmente). But there were problems. Namely, the Manifest Destiny-thumping store clerk that was shoving wagon tongues down my throat while I tried to conjugate six forms of “Tener." Could I possibly be expected to properly label the tiny cat, “El Gato,” when a pixilated personification of my sister was literally pooping herself to an early grave on the cold banks of Snake River? 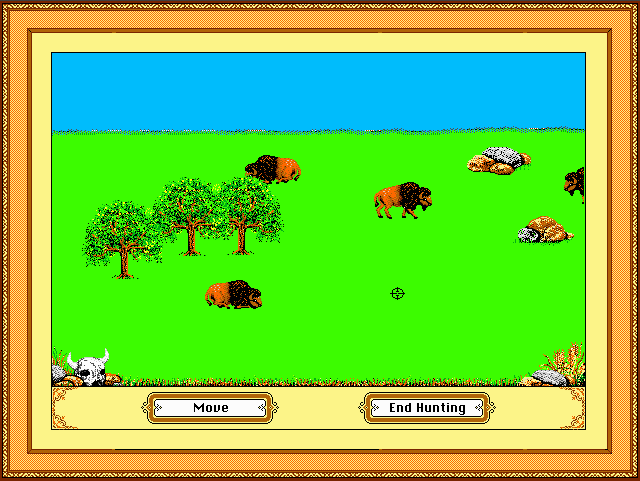 The Oregon Trail , you were the bane of my 10-year-old existence. Needless to say, I never finished that Spanish homework. And as a result didn’t become bi-lingual, screwing myself out of countless scholarships and an understanding of all those tantalizingly saucy Telemundo soap operas. My experience is the perfect example of how this malicious piece of '90s software impaired my learning opportunities, and why it is the definitive microcosm for everything wrong with our education system. That was the day I officially jumped off the proverbial Conestoga wagon (or is it on the wagon? ), and never looked back. 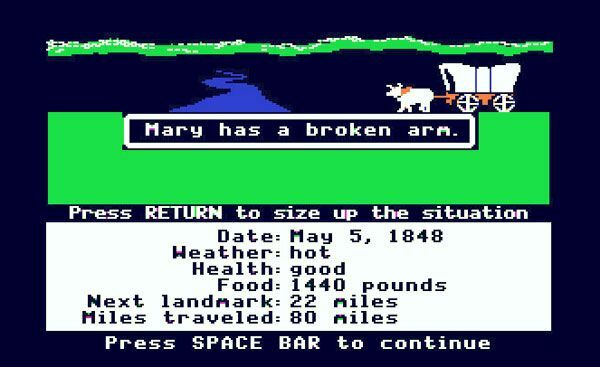 So, while I hate to disagree with my friend/Editor, Ryan Hatch (please don’t fire me), I firmly believe The Oregon Trail is horribly overrated, a waste of time, and certainly capable of ruining lives. In our adult minds, we tend to glamorize our childhood. So, with a thick gauze of nostalgia wrapped around our brains, we think back and remember The Oregon Trail as a little fleet of flying ponies, air-galloping into our school’s Computer labs, delivering eternal happiness and rain-showers of malted milk balls. Well I have news for you: Flying ponies are called Pegasuses, and this sh*t is not as good as you remember. Let's list some other stuff you liked when you were younger: Linkin Park. Zach Braff’s Garden State. Mountain Dew Code Red. Kids make horrible decisions—you were no exception. 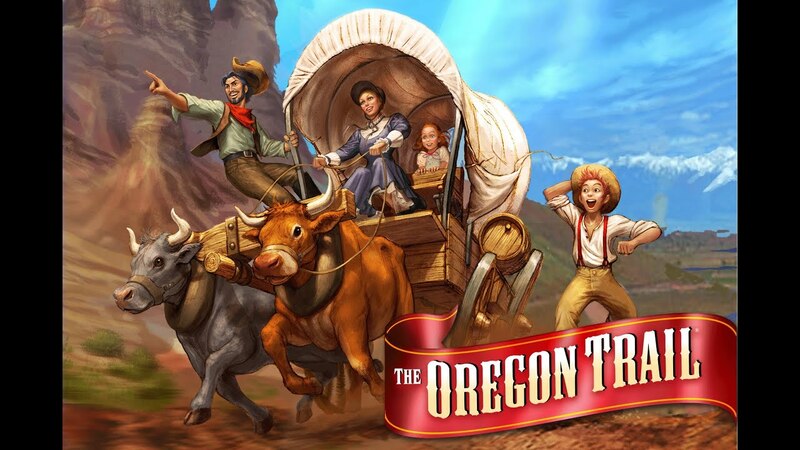 Was The Oregon Trail a fun and entertaining way to learn about America’s Westward expansion? No, it was a cheap and novel way reprieve the horrors of American Education while your teacher finally gave up for the day and turned to her clandestine flask. Everything about TOT was tacky, glitchy and boring. You deserved better my friend. In life, and in Computer Class. Which brings us to the most chilling sentence in all of Edutainment gaming: “Gene was killed by an accidental gun-shot.” What the hell is that? Are you seriously going to just close the case on this one? Have you ever watched any episode of Law and Order, ever? Gene’s story is an award-winning podcast waiting to happen. The lessons supposedly “taught” here just don’t add up, and the ruthless realities presented by pioneer life were just wrong for children. I wonder if the creators came up with a "Trail of Tears" kart racing game or a French Revolution guillotine simulator as a follow-up. How many hypochondriacs has the The Oregon Trail hatched with its constant barrage of cholera, broken limbs and dead siblings? How many hoarders has it spawned, with millions of kids fearing running out of bison meat or axles along the road of life? Nothing here is of any intrinsic value. 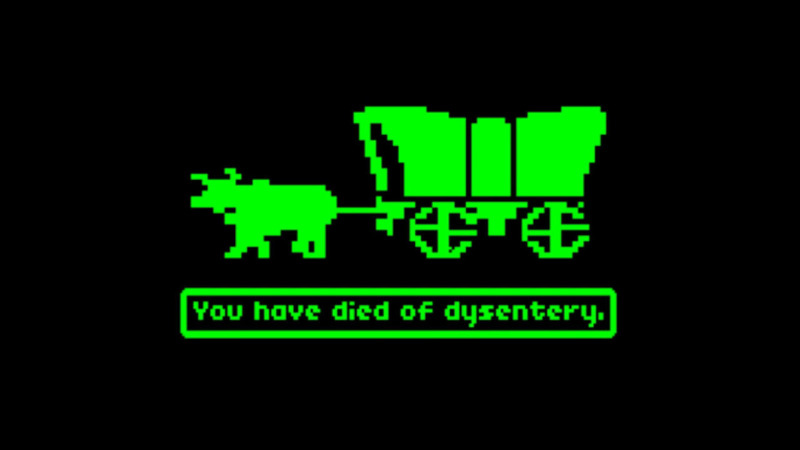 I've never once leaned on any lessons learned in The Oregon Trail. It presented us with challenging problems, sure, but instead of giving us an opportunity to work through them, it merely gave us quick-fix options and random outcomes that had nothing to do with our actual performance or decision-making skills. According to the 'Trail, becoming a Banker and loading up on supplies was all you needed to sail through life, if you didn’t mind dying alone with only your oxen in the Pacific Northwest (which I imagine is still probably true). There were no secrets or strategy. The strategy was to buy a bunch of crap, leave every man behind, and ford every river, son! Is that any way to live? And of course: who could forget about the legendary bouts of dysentery. When a disease consisting basically of “death by constant, watery diarrhea” is the first thing people think of when your game is mentioned, you are probably doing something wrong. In addition to these problems, The Oregon Trail has been heavily criticized in academic circles for being racist, anti-environment, and responsible for embedding negative and false connotations of history into our sponge-like, naive, young minds. Its stereotypical representations of Native Americans and their influence are dated even by 20-year-old standards, and its trivialization of the struggles facing mid-19 century pioneers is borderline offensive. The blatant disregard for oxen health and the light-hearted portrayal of the American bison extinction totally gloss over historical fact/concerns and neglect showing the disastrous ramifications that came with the wanton, wasteful treatment of North American ungulates. And all this was just streamlined into our millennial collective consciousness at an impressionable age, and we're still picking up the pieces. Bottom line: The Oregon Trail has turned the nation’s children (once our greatest resource) into a bunch of murderous, hoarding, blood-thirsty, utilitarian monsters, irrationally afraid of typhoid and snakebites, who don’t know how to tackle actual, practical problems. There is no space bar to continue in this game we call life; there are no restart buttons in the real world. I don’t think it would be hyperbole to say that getting over the negative influence of this game is the defining obstacle our generation faces, moving forward. This is our Berlin Wall, people—and only together, can we tear it down. Say no to casual racism; say no to unsolved family deaths; say no dysentery. Say no to The Oregon Trail.